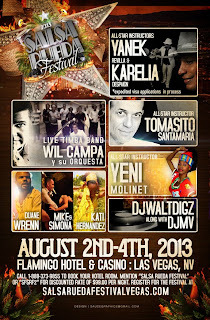 Las Vegas Salsa/Rueda Festival Promo Video! SAVE THE DATE! August 2nd - 4th! It's just around the corner so get your tickets now before the tickets go up. For more information about the festival click here to go straight to the event website. Here is their promo video. Click the link. It's really cool!!! Save the Date for a Casinero Invasion at Sabor on the Bay All White Party! Save the date for Memorial Day Saturday, May 25th! Dress in all white party. If we go in large numbers, then we can hear some timba from DJ Mambo Salvaje and DJ Israel. At least that's what could be negotiated. Here is another opportunity to dance to our hear and dance to our favorite music. Ask the organizers to request they play timba at least a couple of songs. I will make my own e-mail to them, but you can e-mail them and spam their website on Facebook for a polite request for timba. Casinero Invasion at Cafe Sevilla - Thursday April 4th La Farandula Timba Band Playing live! There's power in numbers! La Farandula is playing at Cafe Sevilla. If we get as many casineros out there to dance casino and invade the dance floor to the point of demanding timba, then the band will play timba. But WE NEED YOU to be there! Put your name on the guest list online for Thursday, April 4th. It's a weird link because it says you confirmed for March 28th, but when you scroll on the drop-down menu, it shows you picked April 4th. It's $5 before 10pm. Let's get La Farandula to play the music they love play and we love to hear!!! I will lead a salsa suelta if need be and I will need your help to get the LA salseros to come join our Cuban Salsa Suelta (line dancing salsa) in front of the band! An evening of vibrant Cuban music and dance with Agogo Drum and Dance Ensemble (featuring Patriceann Mead and Silfredo LaO Vigo) and live Salsa with La Farandula! Doors open at 7:00pm; Salsa dance class at 7:30pm; live music and open dance floor at 8:00pm. Go online to purchase your tickets! 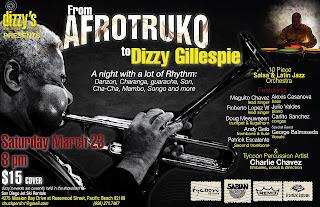 Afrotruko...the best San Diego-based Latin Jazz Orquestra Ever! A group of us went down to Dizzy's last night to see AftroTruko play live. I must say, I am in love with this orchestra. Having been spoiled rotten with quality live Latin/timba/son/salsa music in Seattle, this orquestra is top notch! We could not stop talking about how awesome they were. I am forever a groupie for this band. They played a Los Van Van song "Despues de Todo" and it was so good! Every song they played had a perfect arrangement and the percussion and piano/keyboard made each song have more of a timba feel. While there was a lot of seating in front of the band, there was plenty of space in the back to dance. After the concert, I spoke with some of the band members, some of whom play in the salsa orchestra, La Farandula. I asked when they will play again and the likelihood they will play timba. Sadly, they want to play timba but there is not enough casineros out there to demand it. La Farandula will be playing live at Cafe Sevilla on Thrusday, April 4th. 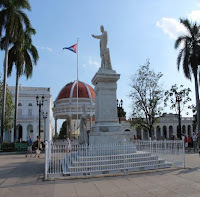 So, here my request to you all who read my blog and my FB group page "Fun Latin Dance by Maritza," can we make a casinero invasion at Cafe Sevilla on April 4th so we can demand the band to play timba??? Can we please!!!!???? They are itching to play timba but they need the audience support to make it happen. Let's do this people! From here on out, If Afrotruko or La Farandula play live, I will post on this blog to let everyone know to go and support these guys! The more casineros there are for these events, the better chances they will play timba. Let's make this happen! I am posting Charlie Chavez and Aftroturko's contact information under the Musicians tab. La Farandula is already in the musician's tab so if you know of groups or venues looking to hire a Latin Jazz/Salsa orchestra, use the blog to send the information. Peace, love and lots of timba! Una Bulla! L.A. WOULD LOVE TO DANCE WITH YOU @ the NEXT CURUYE CUBAN DANCE PARTY!...SUNDAY APRIL 7, 5-9 PM. DJ SAOCO will be SPINNIN' CUBAN SALSA! TIMBA! REGGAETÓN! 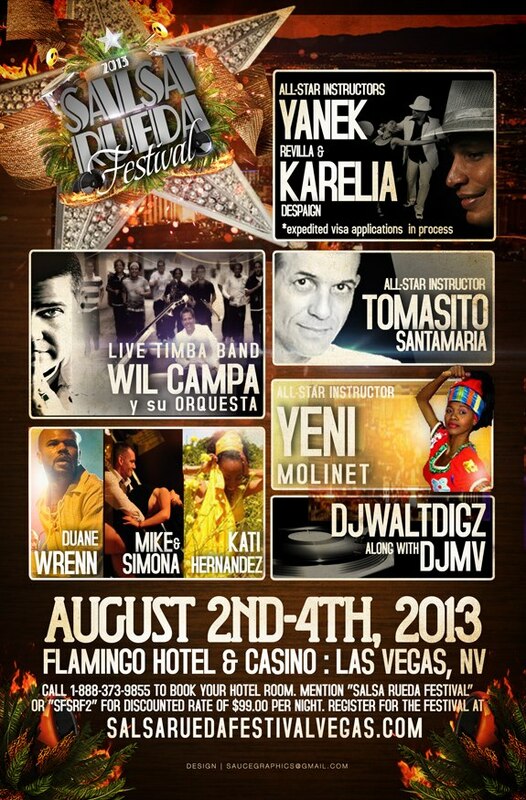 KATI WILL BE TEACHING SOME AFRO TIMBA! AND LET's GET SOME RUEDAS HAPPENIN'! What to bring: a snack to share, layered clothes and something to drink. This is a family-friendly free event. All are welcome. Deadline to Register is Today (March 20th)!!!! Please Read On! Cal Silfredo if you are interested! TOURS, PANORAMIC CITY VISITS, HISTORICAL AND CLASSIC VISITS, TROPICANA SHOW, EXPERIENCE CULTURAL EXCHANGES, TRADITIONAL CUBAN FOOD AND LOTS MORE. Click this link to see the exact itinerary. Deposit of $1200.00 is required at time of booking and only valid until March 20, 2013. Make your reservation now with Silfredo Lao (619) 358-5117. 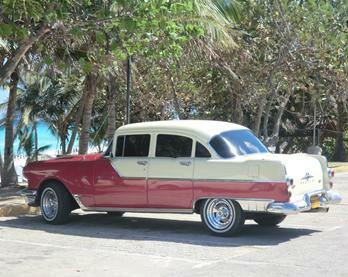 Cuba is in the future but today is the decision to make your visit a reality. Buena Vista SoCal Club will be playing live in San Diego. 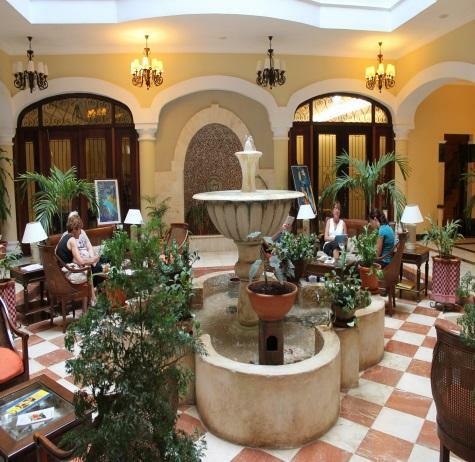 Come and enjoy live Cuban music at Andres Cuban Restaurant. Click here to see the Google directions on how to get there. Plug in your address and this link is already at "point B" which will take you to Andres Restaurant. Cost: No charge, but come have some really great Cuban AND Puerto Rican food! Here is the menu. Casineros far and wide are invited to come to the San Diego Latino Film Festival Closing Party to dance to live salsa music (see below for details). Come see a movie and support this great annual event, Then come shake it on the dance floor with us at the San Diego Air and Space Museum. FREE transportation from movie theater to party venue provided by FIVE STAR TOURS. All night. Park your car at DigiPlex Hazard Center, watch movie, and then let FIVE STAR TOURS take you to the party. Entrance includes one drink ticket (for the first 400 people), live music by ANGEL LEBRON Y SU SABOR LATINO, Manny Cepeda, DJ, chance to mingle with special guests y mas! Attend one of the must-see screenings on Saturday Night! Enjoy fabulous festivities at San Diego Air & Space Museum! Come dance to the irresistible Latin beats of ANGEL LEBRON Y SU SABOR LATINO, MANNY CEPEDA or sip a beverage and hang out with friends, both new and old. VIP guests from SATURDAY night films will also be in attendance for meet and greet. Gala Sponsors: Union Bank, Stella Artois, San Diego Air & Space Museum, Uniradio, Radio Latina, Vida Latina – San Diego, Univision, Fluxx. 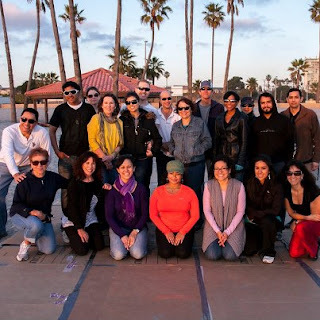 If you know of students at SDSU who want to learn, make sure they know rueda classes will be offered for them. Tonight was so much fun in our Monday rueda class. We have to keep that energy alive and get down with the music. We are holding a rueda practice at Phyllis and Alan's house. They have graciously offered to host it in their backyard. With the day light savings time in our favor (more daylight) and their lovely backyard with a firepit and it's comfy environment, it offers a great space forget-together and rueda practice. When we meet, we will work on enchufla and adios so we can add on some really fun enchufla and adios moves. We also made adjustments to our basic dame to add some flavor to this step for both the leads and the ladies. So come to learn, and practice so we can do this out in the public. Please bring some kind of snack or dish for this get-together. We will be dancing outside so layer up so you can stay warm as the sun goes down. A night with a lot of rhythm: danzon, charanga, guaracha, cha cha cha, mambo, songo and more! 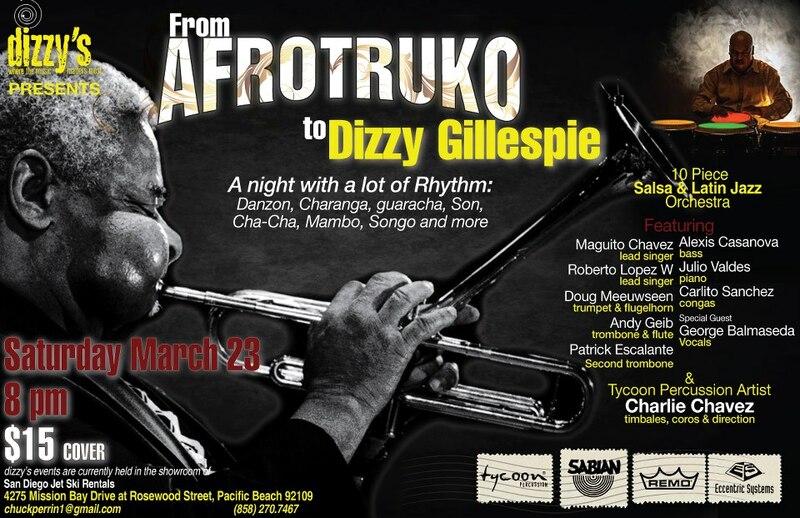 Where: Dizzy's Jazz at San Diego Jet Ski Rentals at 4275 Mission Bay Drive at Rosewood Street, Pacific Beach 92109. Cost – $15 cover get your tickets here. Curuye Cuban Timba Party in LA on Sunday, March 10th! Call to action! Jerri Nachman was kind enough to get a deal (from her connections) on a mini-party-bus to LA. The more casineros there are on the bus, the less you pay. Can we get at 20 "LIKES" on this post to say you are going? CURUYE is going to be Sunday, March 10th from 5pm to 9pm. Which means the bus has to leave no later than 3:30pm to get there and it will come back around 10:30-11pm'ish. We need to know by this Tuesday! If we don't get enough confirmations, it won't happen. If you are not on Facebook, please text me your name e-mail and say "yes, put me down for March 10th"